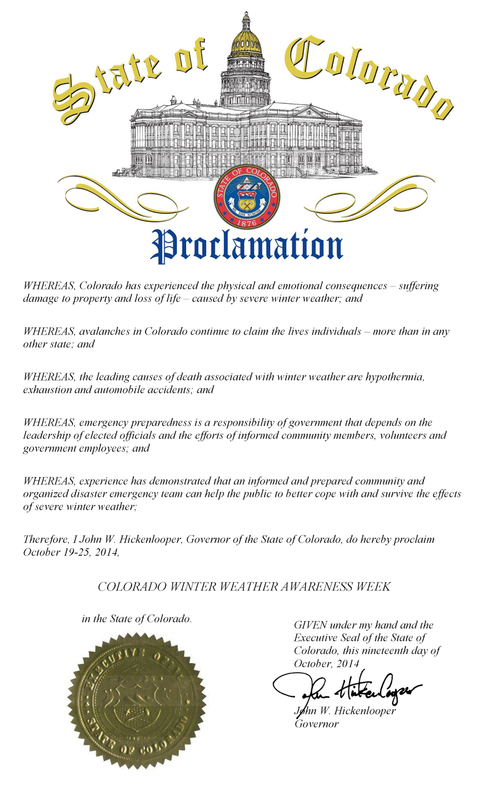 Governor John Hickenlooper has proclaimed the week of October 19 – 25, 2015 as Winter Weather Awareness Week in Colorado. This is an excellent time for all individuals, families, businesses, schools and media outlets to review their winter storm preparedness plans. It is especially important for all new arrivals to the state to become familiar with the National Weather Service watch and warning definitions as well as winter safety procedures. Snow in Colorado is important to the farmers, the ski areas and for filling up reservoirs. However, winter storms often bring heavy snow, bitterly cold temperatures, high winds, low visibilities and slick roads. This can lead to dangerous travel conditions and other life threatening situations such as avalanches and very frigid wind chill temperatures. Pueblo Office: If you live near Pueblo call 719-948-3371. If you live near Colorado Springs call 719-573-6846. If you live near Alamosa call 719-589-3232. Each day Winter Weather Awareness Week blogs will be posted to our READYColorado.com website and posted to our READYColorado Twitter and Facebook accounts. Blog written by Jim Pringle, Warning Coordination Meteorologist, National Weather Service Grand Junction.